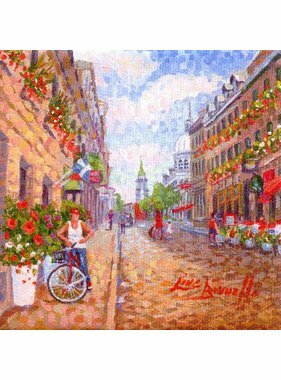 Line Brunelle was born in Montreal. As a child, she was interested in arts (drawing, colours, dance and music). Considering painting as a privileged way to be world-opened, she decided, as a teenager, to become a painter. She completed CEGEP, with a Fine Arts specialization. She then got a Degree in Graphic Design at the University of Quebec in Montreal. Line Brunelle has explored many mediums during her training, but, now, the artist favours painting, which she considers as the best way to express her creation urge. Line Brunelle's work is figurative. She paints landscapes or urban scenes. Her paintings are a contemporary look on history, humanity and society. Her paintings are more than a reproduction of reality. The works are invitations to travel and poetic reflection. It had been said the artist is "a visionary painter who expresses joy". In her works, we detect the influence of her music training : her compositions are harmonious, her colours are tender and refined. 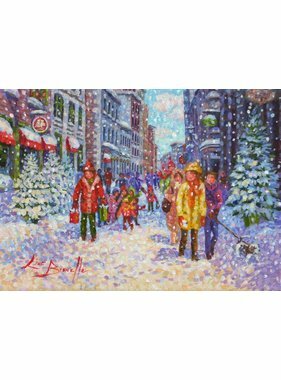 Line Brunelle wants her paintings to be a direct link towards delighting emotions and hope. Her creations are hymns to the beauty of life. 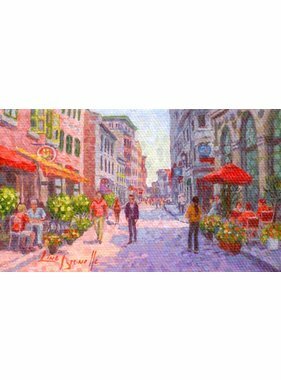 The characteristics of her style are a dynamic and rhytmic brush stroke that gives birth to an explosion of small spots of juxtaposed colours. The modulations of tints accentuate the movement of the time going on. In front of our eyes, forms seem to move constantly. 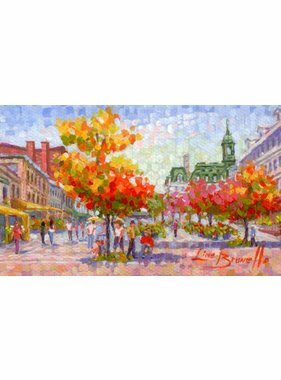 Line Brunelle is a professional member of the Regroupement des Artistes en Arts Visuels du Québec (RAAV) and artist's associations like ALPAP, the Federation of Canadian Artists (F.C.A.) 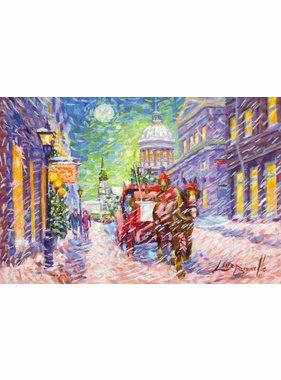 of Vancouver, The Miniature Art Society of Florida (MASF), The Miniature Painters, Sculptors and Gravers Society of Washington D.C. (MPSGS), and The Cider Painters of America (CPA) of Dallas Pennsylvania. 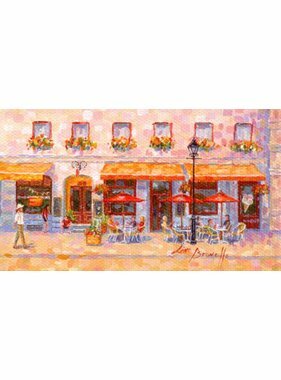 Lovers of arts and collectors appreciate the emotion that she communicates through her brush. They could admire and acquire her paintings at the time of exhibitions in art galleries, museums, cultural centers in Canada, United-States and Europe. Her works can be found in many privates and publics collections around the world. 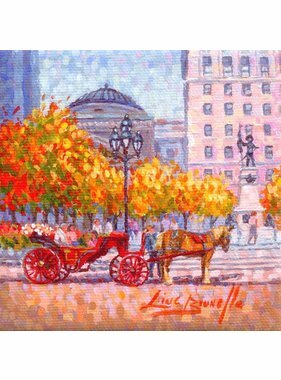 She has received prices for the quality and the originality of her paintings. 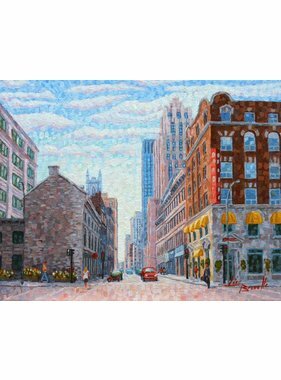 Line Brunelle has been published in the GUIDE DE ROUSSAN, Marché de l'art au Québec, The Répertoire Biennal des Artistes Canadiens en galeries MAGAZIN'ART and The dictionary GUID'ARTS Cotation des Artistes du XVe siècle à nos jours, Larousse Diffusion. 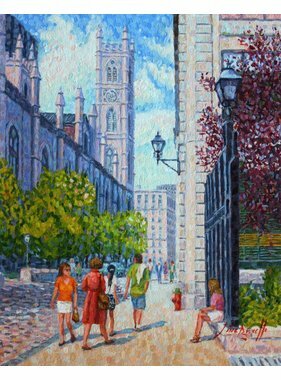 A walk on St-Paul Street 3" x 5"
Notre Dame Street 8" x 10"
One day in December 5" x 7"
Place d'Armes 4" x 4"
St Paul Street 4"x 4"
Sunday morning on the terrace 3" x 5"
The inspiring Notre Dame Basilica 10" x 8"
Winter at St-Paul 5" x 7"